BAHRAIN: After a near faultless weekend in just his second race as a Ferrari driver, you’d struggle to find anyone who thinks Charles Leclerc didn’t deserve to stand atop the podium at the Bahrain Grand Prix. The 21-year-old man from Monaco came painfully close to achieving his maiden Formula One victory in just his second year in the sport. Having stormed to a track record-breaking pole position on Saturday night and after building a comfortable lead over the field in the dying stages of the race, a failed engine cylinder cruelled his chances of taking home the deserved result less than 15 laps from the end. He exchanged frantic radio messages with his pit wall as the team attempted to diagnose the problem, but all the while he was losing bucketloads of time, his car down 40 kilometres per hour on the straights. It took just six laps for Hamilton to close the 10-second gap and pass the stricken Ferrari for the lead, and six laps later Bottas slashed his 37-second deficit to deprive Leclerc of another position. Third place and a point for fastest lap – set before his car began to fail him – was all Leclerc had to show for a dominant weekend on which he announced himself as a championship contender. If the opinions of his chief rivals are anything to go by, the realisation of Leclerc’s dream will likely come sooner rather than later, with praise effusive in the aftermath of his near miss. But though Leclerc was flattered by the praise, the key weekend takeaway that will most buoy him will be that he soundly beat his four-time championship-winning teammate, Sebastian Vettel. Leclerc had the upper hand for just about the entire weekend, blinking only at the start of the race when a poor getaway dropped him to third. He wasted no time recovering, however, and by lap six was back into the lead with a pair of ruthless passes on Bottas and Vettel. Indeed the contrast between the two red-clad drivers grew only starker thereafter. 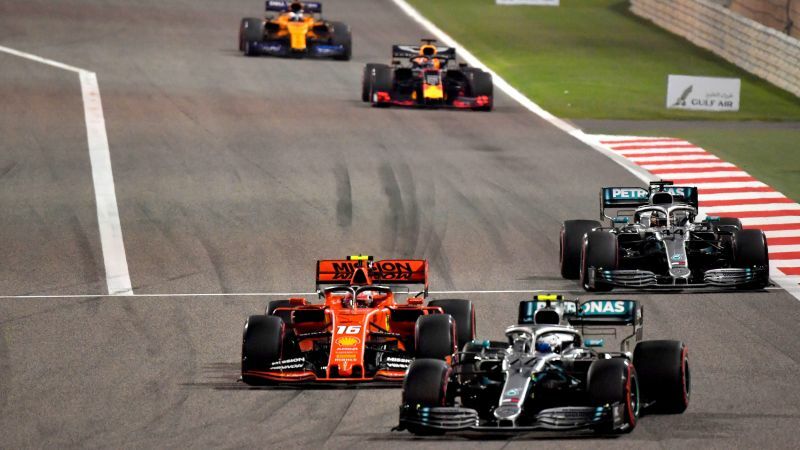 Leclerc sprinted off into the distance, leaving Vettel to fend off advances from Hamilton in a race-long squabble for second place. In the end Hamilton prevailed, but only after Vettel needlessly spun his car as the pair duelled on lap 38. Vettel flat-spotted his two-lap-old tyres so badly that the ensuing vibrations shattered his front wing, necessitating another pit stop that dropped him to ninth, from where he eventually recovered to fifth. It’s far from the first time Vettel has cracked under the pressure of wheel-to-wheel combat – his 2018 title campaign floundered on a litany of similar unforced errors – and with Leclerc serenely controlling the race before his car conspired against him, it was difficult not to accept that the much-hyped challenge to Vettel’s Ferrari hegemony was coming to pass at the hands of the sport’s most exciting rising star. Charles Leclerc may not have won the race, but he most certainly won himself an entry to the 2019 championship fight. The first race in F1 in years. There were actually on track passes among the top 5 contenders and from different teams. Can anyone remember when this has happened in the last 10 years?